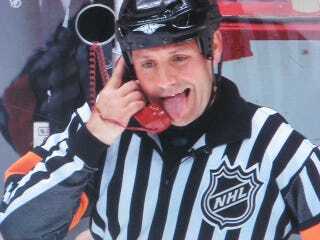 Mini-controversy in Columbus, as veteran ref Paul Devorski allegedly responded to taunting fans by showing them exactly what they can do to themselves. The Columbus Dispatch reports that Devorski made a "crying face" (think fists to eyes, "wah wah" gesture), and pulled out the old classic, "giving them the middle finger while pretending to scratch his face." It wasn't that surreptitious, as about 15 fans independently contacted the paper about it shortly after it happened in the third period of last night's Blue Jackets game. Two guys in front of us started giving the refs (grief) after they clearly missed a call," said Ritter Hoy, who was seated five rows up from the glass in section 109. "Happens at every game, right? Aaron Portzline of the Dispatch says the fans' reaction was audible from the press box. While many of them sound like the took it with good humor, Devorski probably could have picked a better game to do it than one in which the Wild had seven power plays to the Blue Jackets' zero. The league is looking into it, though don't expect much punishment. Devorski's universally respected, and who could stay mad at the guy?